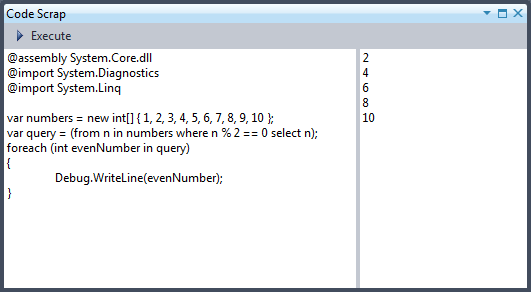 Adds a window for writing and executing scraps of C# code within Visual Studio. 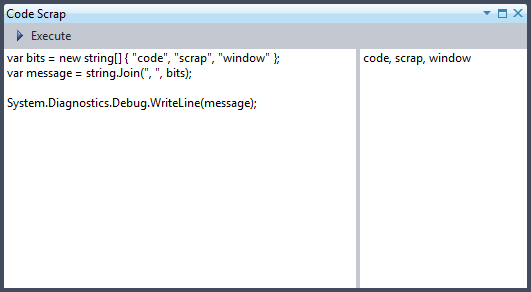 A Visual Studio extension that adds a window for writing and executing scraps of C# code within Visual Studio. Requires Visual Studio 2010 Professional, Premium or Ultimate. Download and run CodeScrapWindow.vsix to install. Restart any active instances of Visual Studio and select Code Scrap from the View -> Other Windows menu.